I want to calculate the flux (amount diffused/area*time) from the samples I have taken. However I am stuck with how to calculate the surface area of the dialysis bag so I can use Fick's law to estimate the flux. 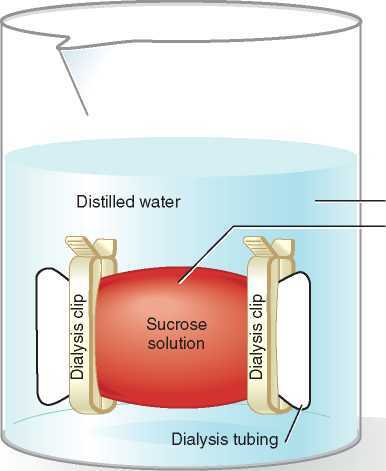 The dialysis bag is cylindrical, however when you put the 2 pins above to close it, it is not completely cylindrical anymore as you can see in the picture. Anyone that could help me out with this? If in need of membrane specifications I can post them. Poke a small hole in the membrane and drain it completely. Stretch gently by pulling the clips (don't let them slip) until the area between them is rectangular. Multiply that area (L x W) by two, because the membrane has two sides around the now-flattened middle. There will always be some small error, because the wet membrane can be stretched somewhat, but that should be insignificant compared to other sources of inaccuracy, such as edge-effects where the clips narrow the membrane, impeding flow.